If Carson Wentz can stay healthy for an entire season, the Eagles should represent the NFC in the Super Bowl again soon. [BLG Note: The Chiefs finished 1st with 14 votes, the Patriots finished second with 10, and the Eagles finished third with four. 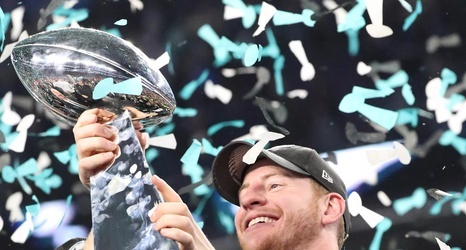 We’ve heard from a lot of coaches and players for the Philadelphia Eagles since the 2018 season wrapped up, but despite rumors and anonymous reports, quarterback Carson Wentz hasn’t been very vocal this offseason.